Are bacon dog treats healthy for dogs? Bacon is a common ingredient found in store-bought treats. However, bacon has a high fat content. Humans love it, but large amounts of it are not recommended. The answer for dogs has been debatable. The dog treat industry is moving toward healthier foods for dogs. We say, if you wouldn't eat something, don't give it to your dog! But in small amounts, or once in awhile, it is probably not harmful unless your dog suffers from a health condition such as pancreatitis in which the ingestion of fat is not tolerated. The recent trends in dog treats are leaning toward making treats that follow human nutritional standards. Dogs do not suffer from the same illnesses that humans get, like cardiovascular illness and high cholesterol. But many pet parents will not feed their dogs meat or cheese because these are foods they themselves do not eat. Dogs were not meant to be vegetarians although some dog owners insist on such a diet for their pets. 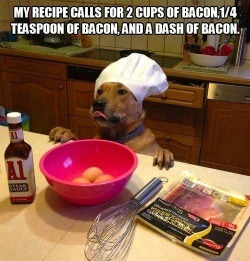 So, if you happen to like bacon and your dog is drooling from the smell....and you really want to give him a piece...this recipe for homemade dog treats is offered to you. Mix the water, egg, oil and cake mix well. Bake for 18-22-minutes. Cake is done when a toothpick stuck into the middle comes out clean. Cut a muffin in half to create a sandwich. Place a slice of cheese on each muffin and then put the bacon on top of one slice of cheese. Put the two sections together and place in the microwave for 15-20 seconds to melt the cheese. Let it cool before serving it to your pet.